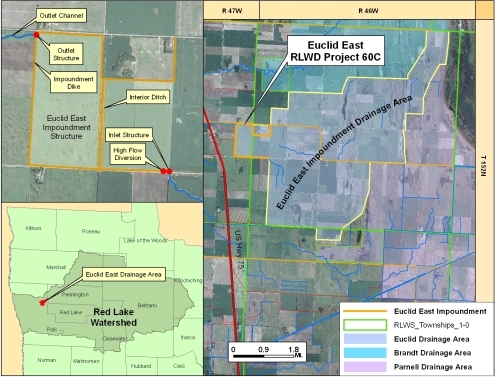 The Euclid East impoundment project (RLWD Project 60C) is located in Section 24 of Euclid Township and Section 19 of Belgium Township, both in Polk County, about 12 miles north of Crookston. Construction began in June, 2006, and was functional for operation by the summer of 2007. The Euclid East project is designed to collect and store up to 2,443 acre-feet of water from a 17.1 square mile drainage area and reduce downstream flooding by allowing the release of the water at a managed rate. The reservoir has reduced peak discharges on legal ditch systems, Branch C of County Ditch #66, County Ditch #66 Main, and County Ditch #2. An important design goal was to provide protection for a 10-year 24-hour rainfall event, and to fully contain the 100-year 10-day rainfall event without overtopping the emergency spillway. By retaining more water in the upland reaches, the project also enhances aquatic resources and reduces downstream erosion. This project was jointly funded by the State of Minnesota, the Red River Watershed Management Board, and the Red Lake Watershed District. The reservoir is constructed of approximately 3.6 miles of earthen clay embankment (332,681 cubic yards), a grass lined emergency spillway, 2.4 miles of inlet channels and culvert works, 0.8 mile of outlet channel and a gated concrete outlet structure. The operable components are built within the gated outlet structure, and are used to control the release of water from the impoundment.